Cinnamon is a spice commonly used in cooking that comes from the bark of the cinnamon tree. When the bark is removed, it's called a cinnamon stick. Cinnamon has also been used as medicine in traditional healing systems for ages. You can grind up fresh cinnamon sticks to make tea, to cook into your food or sprinkle on toast, cereal or desserts. Because it may interact with certain medications, it's important to check with your doctor before consuming cinnamon. The effects of cinnamon on blood sugar levels in people have been studied, and promising results have been found. In a study published in 2009 in the "Journal of the American College of Nutrition," overweight and obese people with impaired fasting glucose were administered either cinnamon extract or a placebo twice daily. The scientists monitored the participants' blood glucose levels and after 12 weeks found that the cinnamon extract group had significantly lower glucose levels than the placebo group. They concluded that the glucose-lowering antioxidant properties of cinnamon may lower risk factors associated with heart disease and diabetes. Another study, published in "Diabetes Care" in 2003, investigated the effects of ground cinnamon sticks on blood glucose levels and found it had the same glucose-lowering effect as cinnamon extract. In a study published in "Diabetes Care," 60 diabetes patients were given 1, 3, or 6 grams of powdered cinnamon daily, or a placebo. After 40 days, all patients who took cinnamon not only had reduced glucose levels, but also reduced levels of unhealthy cholesterol. Specifically, triglyceride levels were reduced by 23 to 30 percent, and LDL -- "bad" -- cholesterol was reduced by 7 to 27 percent. However, there were no changes in the patients who took placebos. 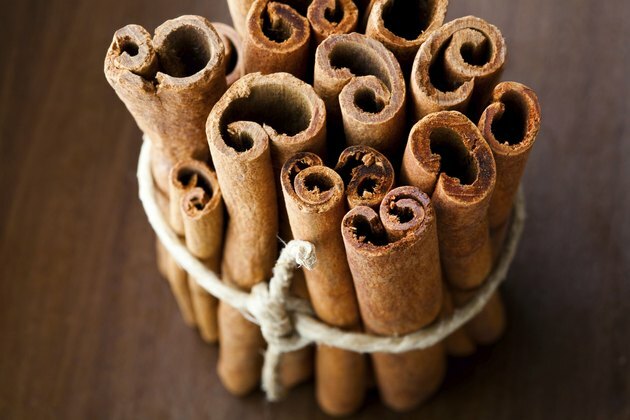 This points to the significant benefits cinnamon sticks have on cardiovascular health. By reducing inflammation, cinnamon sticks may even reduce pain after tough workouts. In a study published in the "International Journal of Preventive Medicine" in 2013, 60 young women were given either cinnamon, ginger or a placebo daily while participating in an athletic training program. Those who received 3 grams of cinnamon powder experienced less muscle soreness than the placebo group after six weeks. In a study published in "BMC Cancer" in 2010, scientists looked at the effects of cinnamon extract on tumor cells in test tubes and in mice. The tumor cells were from cancer of the lymph, skin, cervix and colon. The scientists found that cinnamon extract significantly hindered the growth of tumor cells and even killed some of the tumor cells, both in test tubes and in mice. In a study published in "Cancer Letters" in 2009, scientists found similar results and even stated that cinnamon has potential as an alternative medicine for treating tumors. However, these studies used cinnamon extract instead of cinnamon sticks in their whole form. The effects of fresh cinnamon sticks on cancer cells in humans has not been studied. Can Cinnamon Pills Help With Weight Loss?